A simple recipe for a post-workout Creamy Coffee Protein Smoothie with a secret ingredient to give you a healthy balanced breakfast, post-workout boost, or the afternoon jolt you need! Can anyone guess what the secret ingredient in this Coffee Protein Smoothie is that gives it a ton of protein? I love guessing games, don’t you? If you guessed cottage cheese, then you would be correct. I made this Peach Pie Protein Shake a few weeks back and everyone seemed to love the fact that it had that extra boost of protein from cottage cheese without ever even tasting the cottage cheese at all. It does seem weird to add cottage cheese to a drink, right? Well, it works…and it works well. I’m sure it helps that Friendship Dairies has the best tasting cottage cheese out there (just saying…) but nobody would ever know it was hiding inside this Creamy Coffee Protein Smoothie! I LOVE Friendship Dairies, especially because of the fact that they are located just a hop, skip, and a jump from where I live here in Rochester. Gotta love the local companies! 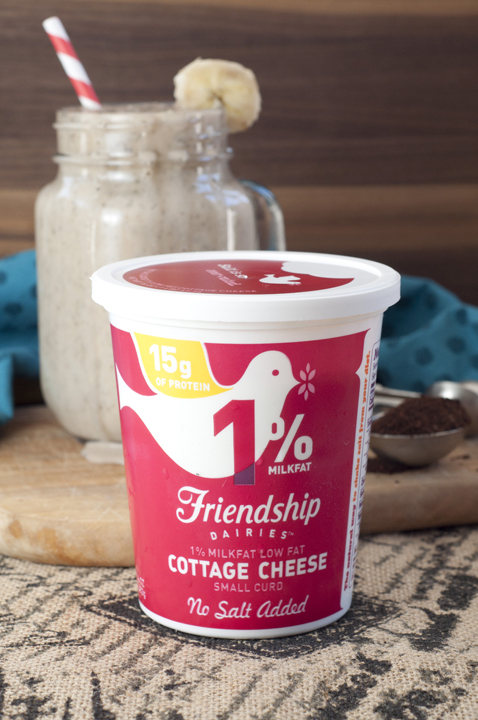 Friendship Dairies cottage cheese is known as the “Original Superfood” since 1917 and is very high in protein (1% milkfat has 15g per serving and 2% has 14g). 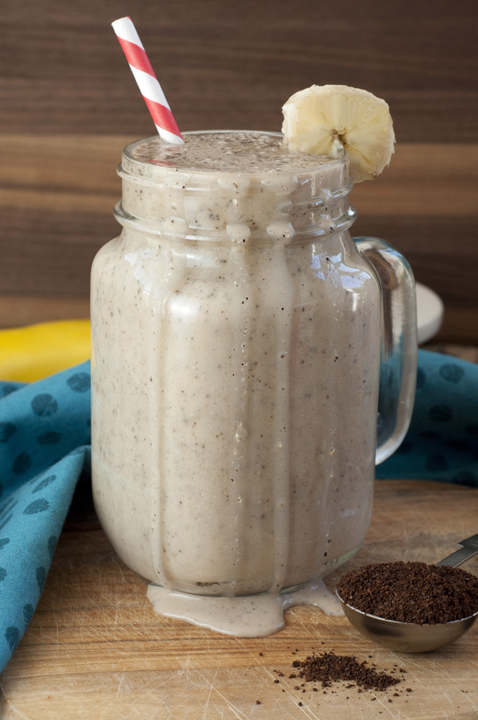 This Coffee Protein Smoothie is a good source of long-lasting energy at any point during the day and you can mix it up with just about anything for a healthy snack. You should also check out my Chocolate Covered Cherry Protein Shake! Besides this Coffee Protein Smoothie, I have something else that’s really cool to share with you today. 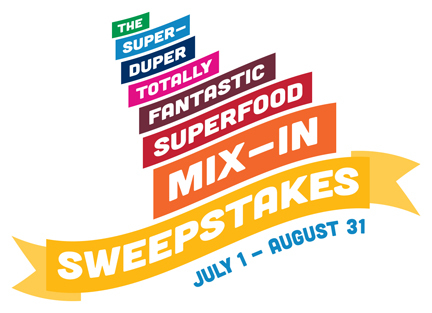 Friendship Dairies is giving away up to $5,000 in weekly prizes through August 31, including three $498 Vitamix grand prizes (um, yes, please!) This is my DREAM blender! No big deal…. The sweeps started July 1 and runs through August 31. Make sure you enter as soon as possible because participants can come back once a day from now until the deadline to enter! Each daily entry is submitted into the big grand prize drawing. Plus, if you choose to share about the sweeps on your Facebook wall, you get a bonus entry for every one of your friends that enters via your post. Pretty awesome! You can check out the prize calendar on their website for the prize list and see all of the other great things you can win. Use the Superfood Generator to select a cottage cheese. Choose up to 3 mix-ins. Enter the sweepstakes via the form you will see. Done! Also, you should know that Friendship Dairies website has a newly launched Superfood Generator that I just adore and this is what you will be using to enter the sweeps! 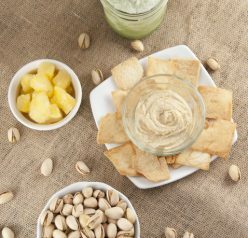 It is a fun, inspirational online tool that helps you discover the endless possibilities of cottage cheese and give you great ideas for mix-ins along with their nutritional benefits. Visit here and follow the instructions to create your very own personalized Superfood recipe – it’s so fun! You pick all of your mix-ins and then the generator gives you a “Super Summary” which tells you how much protein is in your creation. You can also peruse the site and check out all the tasty, easy recipes – I get so many good ideas from there! I have a Frosted Sugar Cookie Protein Smoothie you need to check out! Milkshakes with added health benefits are EVERYTHING. I also have my eye on these Peppermint Patty Milkshakes from my friend Rebecca. Now, back to the food! 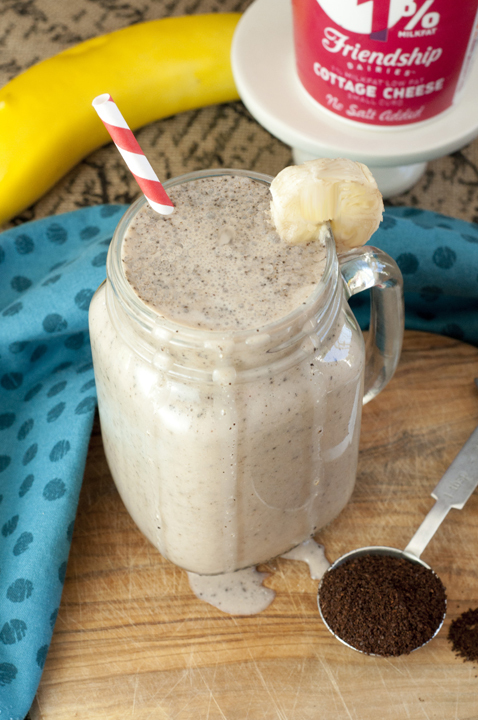 This Creamy Coffee Protein Smoothie gets you well on your way to your morning coffee fix and also has the benefits of a balanced breakfast all in one. With instant coffee powder, banana, cashew milk, and dates, it has just the caffeine boost you so desperately need (any time of the day, really). Protein, fiber, and caffeine all rolled into one – I love killing three birds with one stone! I am not a big coffee, tea or cola drinker at all so this smoothie is going to be my new go-to way of giving myself a boost of energy whenever I need it. This boost is needed often, in case you were wondering. It’s perfect for the summer when you don’t want a hot caffeinated drink and gives your body something nutritious at the same time! Good luck and I hope you win some great prizes in the #superdupersweeps! 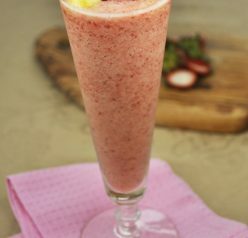 Put all ingredients in a blender and blend until it has reached a smooth and creamy consistency. Garnish with a slice of banana, if desired. Pour into glass(es) and serve. Sweepstakes disclaimer: NO PURCHASE NECESSARY. For rules, visit here. Thank you so much, Johlene! I hope you enjoy it, Ashley! Awesome! My husband eats cottage cheese by the spoonful while I prefer it in lasagna. 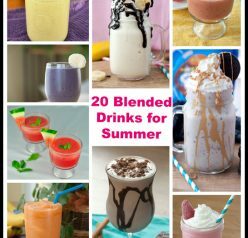 This is great way for me to get more cottage cheese in my diet while enjoying a tasty beverage! OH he would love this then! WOA – there’s cottage cheese in this???? Freaking fabulous!!! Yup – it’s the secret ingredient!! As much as I love coffee, the thought of drinking it hot isn’t my thing right now because of summer and all that. But this smoothie solves my dilemma. Awesome. This is the perfect solution to getting your coffee fix in the summer! What a terrific recipe! It’s breakfast beverage and meal all in one. Perfect for those sleepy mornings! Thanks so much. Thank you, John! Yes, it can be a meal for sure! Me oh my, pickles, and pie, I spy a protein smoothie in my eye! Ok, so I really don’t want to seem to be too judgmental, but it seems like you spilled some of the smoothie on the ground :-/. Before your pictures you should probably clean that up, ya know, it’s all about presentation. You know what they say…, “presentation, presentation, presentation.” But it’s ok, we all make mistakes. You should definitely try it! They are the best! Great idea! 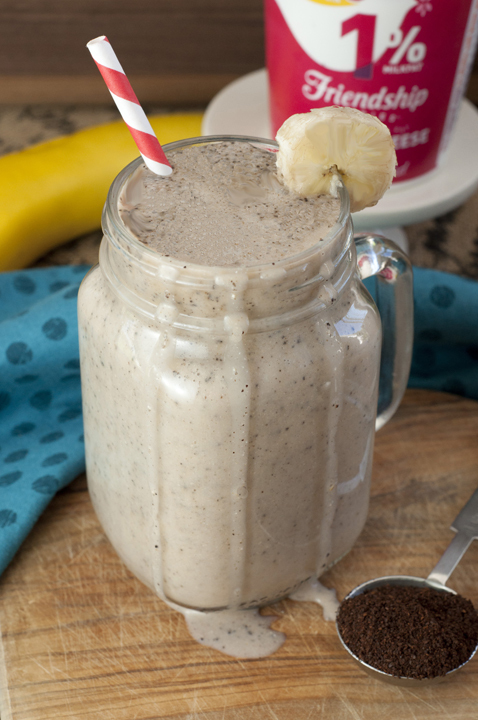 Love the extra jolt of coffee in a healthy protein smoothie! I never would have guessed that it was cottage cheese! Fantastic! Might have to give these a try over the weekend! Awww thanks Angie! I hope you love it! I love starting my day with a smoothie! Coffee and protein? I’m in! What an unusual smoothie and it sounds great! Smoothies are one of my favorite things, and I love that you used cashew milk. Yum! Another great one with cottage cheese! I love that idea! Thank you, Jaren! It’s so good! I love cottage cheese yet always forget how great of a smoothie addition it is. Great for protein when you don’t want to use powder! Love that this is made with cottage cheese! And the friendship dairies site has such great recipes ideas too. I never in a million years would have thought to add cottage cheese to a smoothie.Interesting!! I would’ve neva neva neva guessed this smoothie has cottage cheese in it. That is genius Ashley. Love this smoothie recipe and I will be trying it very soon. You are speaking my language with this protein and caffeine filled smoothie! So perfect for refueling with after my morning runs! Protein shakes are so YUM! Coffee and protein!? I’ll take it! I’ve never thought to put cottage cheese in a smoothie, but it makes sense for the protein boost. This looks great! I love Friendship Dairies cottage cheese!! This is a great way to sneak more protein into those smoothies!